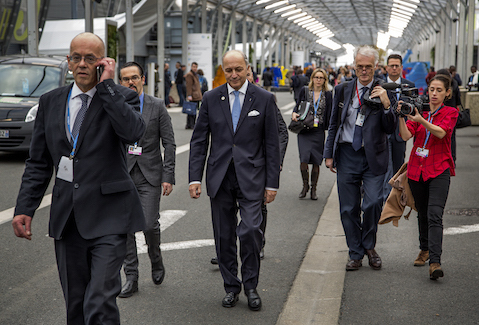 COP21 President and French Foreign Minister Laurent Fabius (center), pictured walking between conference halls at Le Bourget, will take center stage in the days ahead as he rides careful shotgun over the final negotiations and works to broker peace between disagreeing nations. The first week is done and dusted. 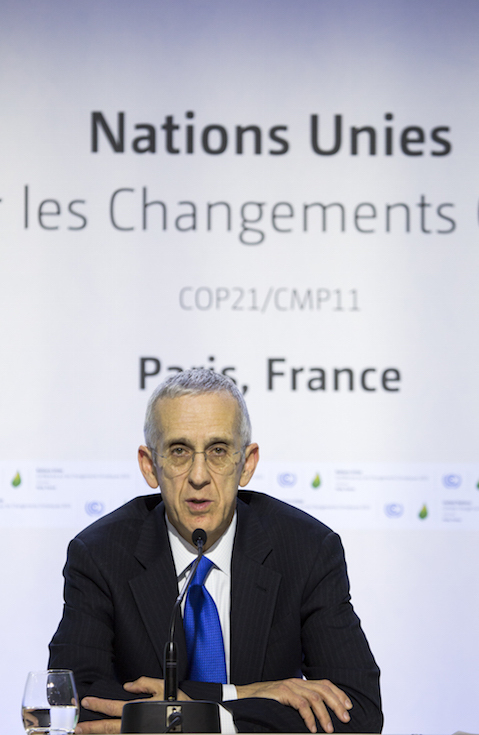 By high noon Paris time on Saturday, French Foreign Minister and COP21 President Laurent Fabius firmly requested that a streamlined draft agreement be turned over to him and his team in anticipation of the soon-to-begin “ministerial” level negotiations. These high-level talks are the final phase of the conference and the realm in which any potential Paris Agreement will ultimately be decided. Things are about to get real. So where are we now? Well, after Thursday’s fireworks, the painstaking process of whittling away points of contention resulted in yet another new draft being released around 10 a.m. Saturday. Reflecting the desires of the G77+China group to have some of the more controversial issues surrounding funding and liability teased out into a separate stream of language for clearer negotiating purposes, the new draft came in two forms, a 38-page primary document that featured “bridging proposals” by the conference facilitators aimed at addressing the biggest of the aforementioned issues and a 46-page total compilation document that more completely represents the sticking points. No matter how you look at it, today’s draft continues to represent certain overall progress while also continuing to guarantee ongoing head butting between the “developed” countries of the world, such as the United States and the European Union, and the still developing nations that make up the lion’s share of this United Nations process. Certain big ticket issues like transparency (how countries will show that they are meeting reduction goals, etc.) have been all but resolved while others, like financial responsibility and liability (what developed countries will pony up to help less fortunate nations meet the challenges of climate change) remain ripe for conflict. At the risk of being overly reductive, the primary problem facing a true planet-serving agreement here in Paris by the end of next week is a phrase activists have long employed and politicians are just starting to get hip to: “climate justice.” There is a vast and historic disconnect in international level climate talks between the haves and the have nots of the world. It is the need to reconcile this chasm of divergent viewpoints in a manner that not only benefits the planet at large but also lifts all people up no matter their home country that is the very essence of “climate justice.” It is a call to better balance the roles and requirements between developed nations and undeveloped nations in a final treaty. 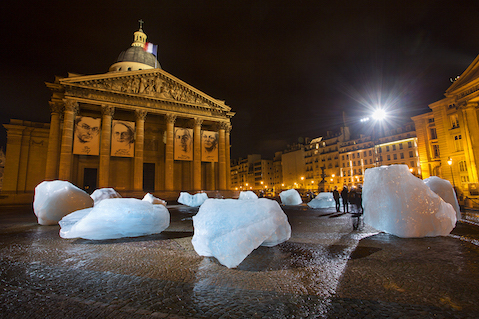 Twelve massive chunks of iceberg from Greenland have been placed in front of The Pantheon building here in Paris and left to melt slowly over the coming days. It is an installation piece from Danish artist Olafur Eliasson and Danish geologist Minik Rosing called "Paris Ice Watch." One percent of the world’s wealth is responsible for the same amount of Earth-destroying carbon emissions as all of the bottom 10 percent combined. That is to say, the folks at the top, like the United States and China, have played a much bigger historic role in creating the environmentally dire situation that has set the stage for COP21 than smaller, undeveloped nations like those found in Africa, the South Pacific, and much of Central and South America. This separation rears its head in any number of ways; however, it can be boiled down to two words, responsibility and capability. That is to say, what is a nation’s responsibility in creating the climate problem, and what is their correlating responsibility to help fix it? And what is a nation’s capability to implement the necessary changes and adapt to a changing planet? And, should they need it, where exactly will financial help come from for the most vulnerable nations amongst us? 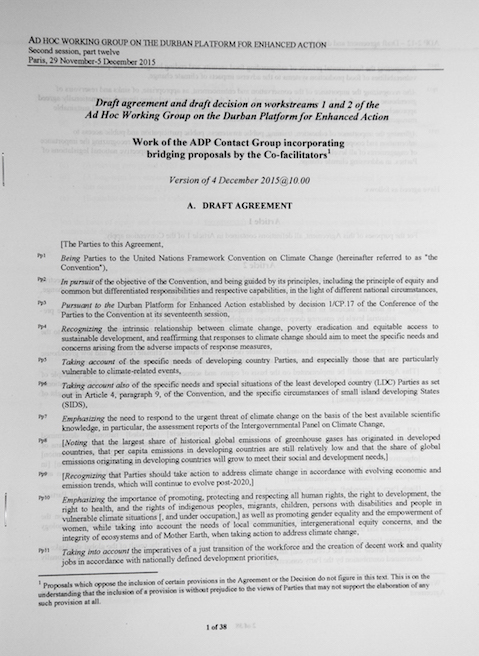 These are the themes that mark the difference of opinion on critical draft agreement text about pledges to cut emissions, the creation and ongoing support of an international finance system to underwrite adaptation efforts, the manner in which countries will be held accountable, and what happens if they fail to do so. Virtually every bracket or option in the current draft released Friday is a manifestation of these questions. The deal closers from all 190-plus countries arrive in Paris this weekend. This impressive collection of foreign ministers and secretaries of state will be the ones who, with a little prodding and logistical help from Fabius and his team, will decide the fate of any hopeful Paris Agreement. Will the spirit and undeniable environmental imperative of compromise help the process find its way, or will old battle lines once again be drawn between the rich nations and the poor? These questions will be front and center come Monday morning at Le Bourget center, and the Paris Project will be live and direct from the front lines to bear witness. Stay tuned. Our collective future hangs in the balance. Scenes like this are common throughout the Climate Generations area (known as Espaces Générations Climat here in France) adjacent to Le Bourget. It is a public space hosting scores of workshops and talks during the nearby United Nations conference. 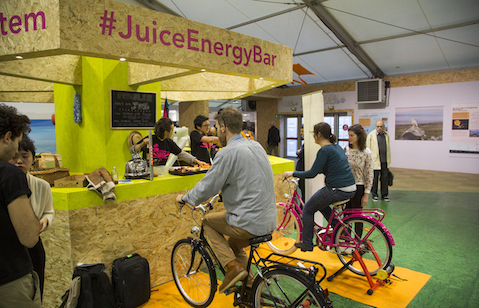 Throughout the area, attendees are encouraged to explore their understanding of energy in a host of interactive ways, such as peddling to power a juicer.